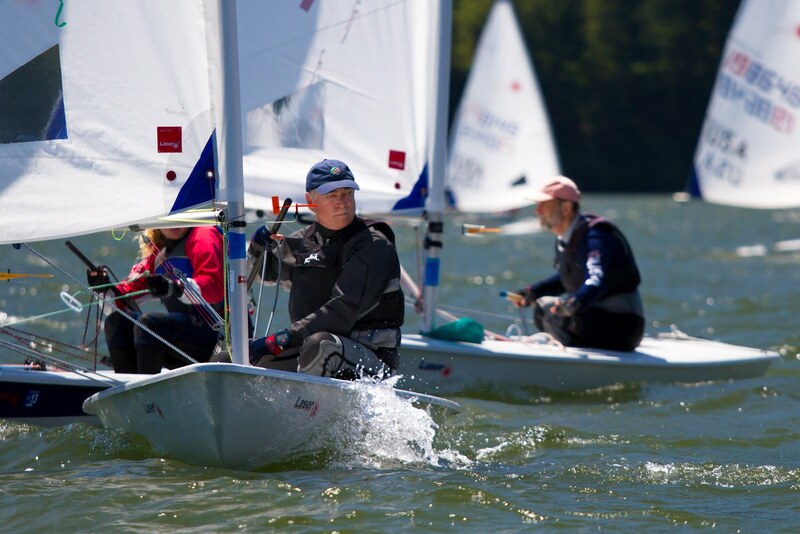 Four races were sailed on Saturday on Day 3 of the Laser North Americans, under warm sunny skies and a breeze that built to a steady 21 knots. 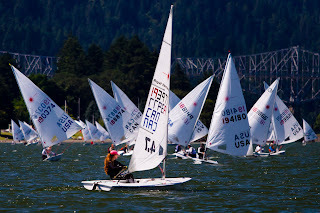 Sailing families suntanned and swam in the Columbia River with a great view to the racecourse as 170+ Lasers whipped around a challenging course. The leaders in each fleet have consolidated their positions and look good going into the final on Sunday. Scoring two bullets and two second places again today with a 13 point lead, 21-year old Chris Barnard, from Newport Beach, Calif., finally had a big smile on his face after racing today, very satisfied with his first place but knows there’s still more racing. (You have to catch him after racing to chat to him as he’s just too focused on racing to talk in the mornings, at least that’s what his buddies told me). “I’m definitely pleased tactically and strategy-wise playing the first beats, staying conservative and making sure I’m in the race. Downwind I’m staying aggressive and using my speed to make my gains, I’m hiking hard and just keep working hard. 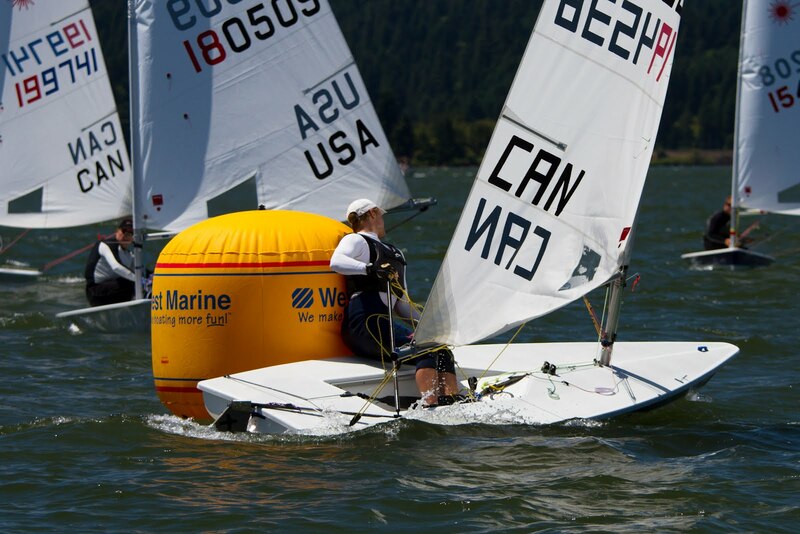 We’ve still got a few more races left and so I’m just sailing as hard as I can,” Barnard said. In the Radial fleet, Malcom Lamphere will be a little disappointed with his result today finishing with 16 points, just 1 point behind Isabella Bertold who sits in first, as he was really hoping to be sitting that first spot. Lamphere threw out his first two races where he placed 10th and 12th, faring better with a second and first in the last two races of the day. 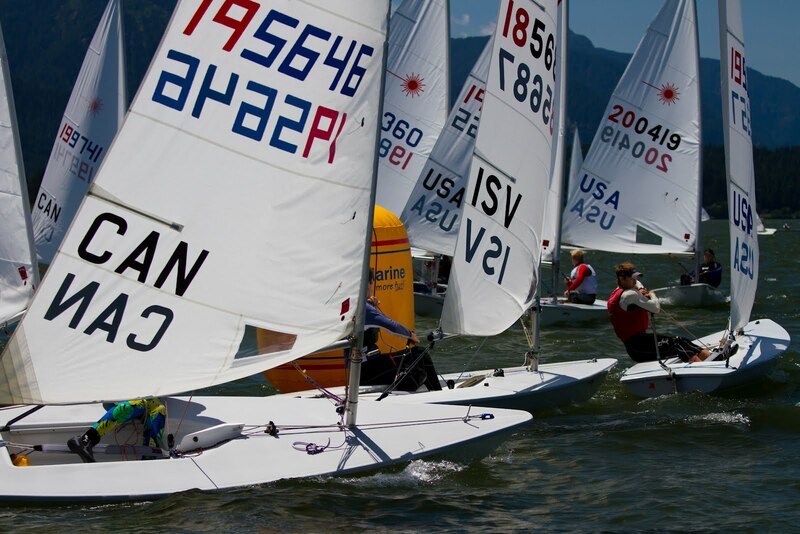 Veteran Al Clark, 52, who coaches the Royal Vancouver Yacht Club team, sits in third in this competitive fleet. He says the kids keep him young … and obviously quick. It’s extremely tight at the top of the 4.7 fleet, with the top four mixing it up by a just a point. Patrick Shanahan finished the day with 16 points just one point ahead of nemesis Ford McCann, while Daniel Kendrick and Parker Hughes are tied for third with 42 points, making for a big lead for the top two in this fleet. He’s also been impressed with the high level of competition. Based in Cascade Locks, Oregon, CGRA has been promoting small boat sailing events in the Gorge since 1996. Today, CGRA enjoys a reputation for excellence in regatta management and continues to host a growing number of premiere one-design regattas, national, North American, and world championships. Over the last 15 years, we have hosted more than 50 major competitions. 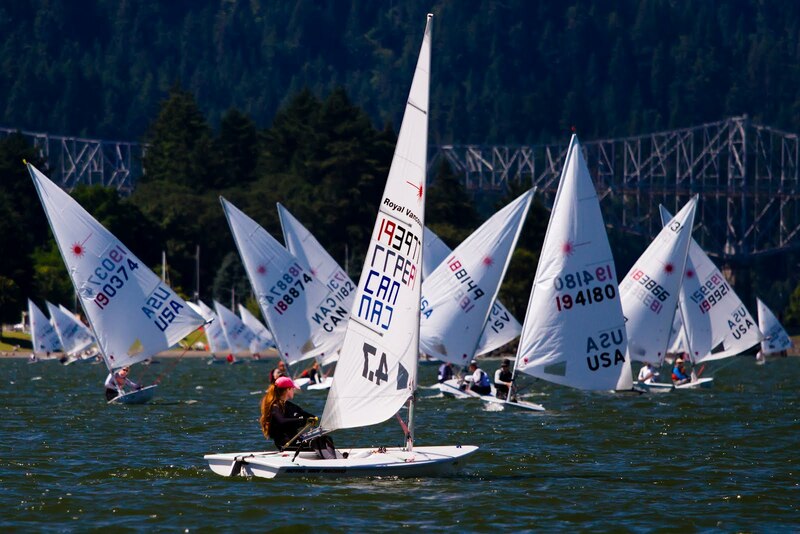 As participation grows for sailing in the Columbia River Gorge, the CGRA is expanding its efforts to support the overwhelming interest. Thanks to individual and corporate generosity, we hope to add equipment, staff, volunteers, and other resources. To volunteer or contribute, please visit: http://www.cgra.org/Support_us.htm.